Paru le 11 mai 2018 chez Universal Music Australia Pty. 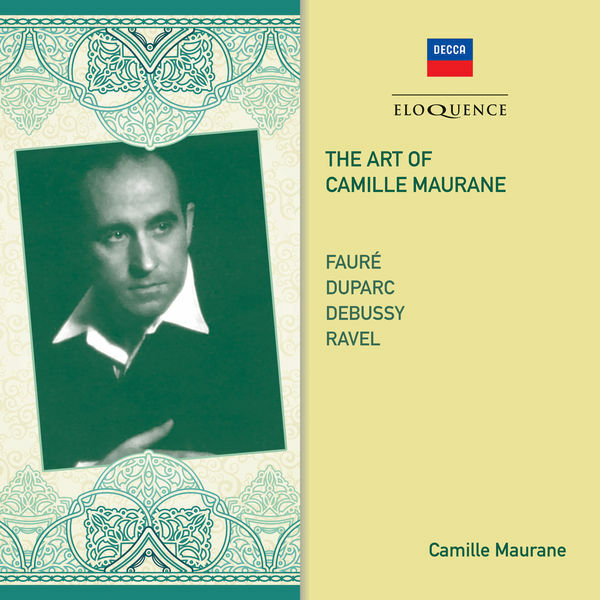 Ltd.
Camille Maurane, Baritone - Lily Bienvenu, Piano - Henri Duparc, Composer - Charles Pierre Baudelaire, Author Copyright : ℗ 1955 Universal International Music B.V.
Camille Maurane, Baritone - Lily Bienvenu, Piano - Henri Duparc, Composer - René François Sully-Prudhomme, Author Copyright : ℗ 1955 Universal International Music B.V.
Camille Maurane, Baritone - Lily Bienvenu, Piano - Henri Duparc, Composer - Armand Sylvestre, Author Copyright : ℗ 1955 Universal International Music B.V.
Camille Maurane, Baritone - Lily Bienvenu, Piano - Henri Duparc, Composer - Jean Lahor, Author Copyright : ℗ 1955 Universal International Music B.V.
Camille Maurane, Baritone - Lily Bienvenu, Piano - Henri Duparc, Composer - François Coppée, Author Copyright : ℗ 1955 Universal International Music B.V.
Camille Maurane, Baritone - Lily Bienvenu, Piano - Henri Duparc, Composer - Théophile Gautier, Author Copyright : ℗ 1955 Universal International Music B.V.
Camille Maurane, Baritone - Lily Bienvenu, Piano - Henri Duparc, Composer - Charles Leconte de Lisle, Author Copyright : ℗ 1955 Universal International Music B.V.
Camille Maurane, Baritone - Lily Bienvenu, Piano - Henri Duparc, Composer - Thomas Moore, Author Copyright : ℗ 1955 Universal International Music B.V.
Camille Maurane, Baritone - Lily Bienvenu, Piano - Henri Duparc, Composer - Robert de Bonnières, Author Copyright : ℗ 1955 Universal International Music B.V.
Camille Maurane, Baritone - Lily Bienvenu, Piano - Gabriel Fauré, Composer - Paul Verlaine, Author Copyright : ℗ 1955 Universal International Music B.V.
20 8. N'est-ce pas ? Camille Maurane, Baritone - Orchestre des Concerts Lamoureux - Jean Fournet, Conductor - Claude Debussy, Composer - Francois Villon, Author Copyright : ℗ 1955 Universal International Music B.V.
Camille Maurane, Baritone - Orchestre des Concerts Lamoureux - Jean Fournet, Conductor - Maurice Ravel, Composer - Paul Morand, Author Copyright : ℗ 1955 Universal International Music B.V.
Label : Universal Music Australia Pty. Ltd. This Compilation ℗ 2018 Universal International Music B.V.
Pelléas légendaire, le grand baryton français s’est éteint à l’âge de 98 ans.